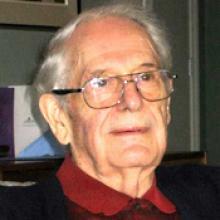 Thomas Arnold Crosier was born in Sherburn Malton, York England on September 23, 1927. He was educated at Nunthorpe Grammar School in York, His engineering training began, as a junior draftsman, with the LNER Railway which became British Rail in 1943. After York, he worked in Edinburgh and London. With the completion of a Bachelor of Science in Engineering degree at London University, he worked for several years with Mott, Hay and Anderson Consulting Engineers working as a designer and resident engineer. In the next several years the company evolved and in 1976 Crosier joined David Kilgour in founding Crosier Kilgour and Partners. Mr. Crosier died on June 16, 2005.